The lyrics from the song “Remember Me” were very emotional. Today I went to see the new Disney movie, Coco, which opened on Wednesday for Thanksgiving weekend. It highlights Day of the Dead, which is a favorite unit of my Spanish language classes, who are often surprised to learn that it is not just “Mexican Halloween.” We make calaveras, the decorative skulls, and we talk about the concept of how the spirits of loved ones who have passed away are believed to come back to visit their families on that holiday. Their spirits live on as long as they are remembered by the living who loved them. I always tell my students that although I don’t really celebrate Day of the Dead, I am moved by the idea that the spirits of my parents and Ben would come back to me every year, but that I often feel that they are watching over me. 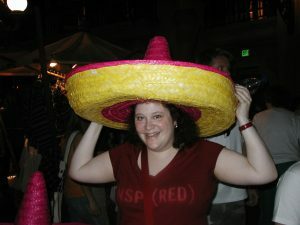 Trying on sombreros at the Mexican pavilion never got old with us! I have always looked forward to the new Disney and Pixar films. I was definitely intrigued by this movie because of the theme. 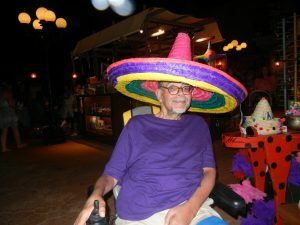 When Ben and I went to Walt Disney World, I did love the Mexico pavilion at Epcot, where the artisans could be seen making beautiful Day of the Dead crafts and spirit animals. As I took my seat in the theater, I thought about how one of Ben’s and my favorite traditions was going to the Thanksgiving Disney movie release on opening day, or opening weekend. As his ALS progressed, that became more difficult, until it became impossible. Today, I missed him terribly and felt very lonely and alone. Some things- particularly Disney things- will never be the same without Ben. Coco was absolutely beautiful, but very emotional, given my own losses. For one thing, the character Coco is young Miguel’s great-grandma, who is delighted by her great-grandson, although her memory of him and of everyone, is fading. But, Coco is loved and respected, cared for by the whole family. I was happy to see Disney tackle the issues of respect for the elderly and memory loss in a sensitive, touching way. But, it was also poignant, since it echoes my own experience with my great-aunt, with whom I was so close, but who now seems to know that I am familiar, but does not know who I am. Since she does smile and get animated when I visit her, I comfort myself with the belief that memories of me are somewhere in her mind. I cannot have the same relationship with her, but I continue to visit her and take comfort in making her laugh and smile without dwelling on that she does not know my name, or that I am her niece, the daughter of her sister, whom she also does not remember. Also integral to the plot is the profound love of and connection to music that Miguel feels to his core. Ben would have strongly related to that. Playing music and recalling lyrics that resonated with him were key to who Ben was. I took comfort in knowing that Ben would have enjoyed Coco‘s emphasis on the vitality of music. Since my birthday and Halloween, I’ve been struggling with missing Ben so much. This was our favorite time of year and there are constant reminders of him that make me feel very alone. Although it unnerved me and had me in tears at various points, Coco was a powerful, and, actually, a positive reminder that Ben, my mom and dad, my grandma and all of the other people I’ve loved so deeply but lost, are always with me in my heart. I was fortunate to be able to tell my dad, my grandma and Ben that I would never forget or stop loving them. Remembering them keeps them close to me always and, very significantly, it keeps their spirits alive. Sometimes that’s not enough, like today, when I wanted to be sitting next to Ben and holding his hand, knowing that as soon as he would have seen Coco he would have handed me a tissue and I would have started laughing through my tears because he knew exactly what tugged at my heartstrings. In typical Disney fashion, it is a movie that can be enjoyed by children of all ages. It is vibrant and colorful and fun, yet it also carries important messages for all of us about life, aging, love and loss. Ben would have loved, as I did, that there was even some Spanish language in it! 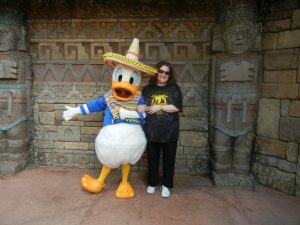 Donald Duck hangs out in the Mexican pavilion at Epcot but I don’t know how much Spanish he spoke!